Once a dishwasher shows signs of failure, evaluating the pros and cons of hiring a Campbell CA appliance repair company to repair it becomes imperative. 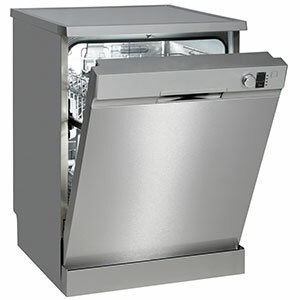 A dishwasher repair is usually very affordable as it just requires the technician to replace the defective dishwasher parts. Most repairs are also very quick as there are extensive inventories at the few stores we go to for dishwasher parts in Campbell CA. We suggest that our clients looking for a dishwasher repair in Campbell CA decide on whether a dishwasher repair is financially worthwhile based on how much more it would cost to replace the unit. The value of the current dishwasher is also an important consideration, as you don't want to replace a $700 dishwasher with a cheaper, but still new $300 model when $200 is all it will cost to fix it. However, tossing in an extra $100 to get a new $300 dishwasher in place of an old one of the same value is sensible. If you think you still need a dishwasher repair in Campbell CA, we would appreciate being considered for the job. We will be able to give you an estimate for the cost of the entire repair after the defective dishwasher parts are identified. Unlike other Campbell dishwasher repair companies, we also give you an estimate that factors the fair value for the parts and labor; we don't mark up costs to score additional profits. Fixing a dishwasher isn't rocket science, but you need the right education and tools. If you currently need a dishwasher repair in Campbell CA, contact us and we will assist you. Do not ever use Drano in your dishwasher. When the water 'drains' out it is really getting sent out with a water pump. An inability to 'drain' could be caused by either a malfunctioning pump or a clogged drain hose. If you have used drain cleaner, you might end up having to get the pump and seals replaced. The same is true when using similar products; instead, use a rinse aid to get the water to evaporate and 'drain' faster. Also, make sure to run the hottest cycle whenever trying to clean the inside of your dishwasher.